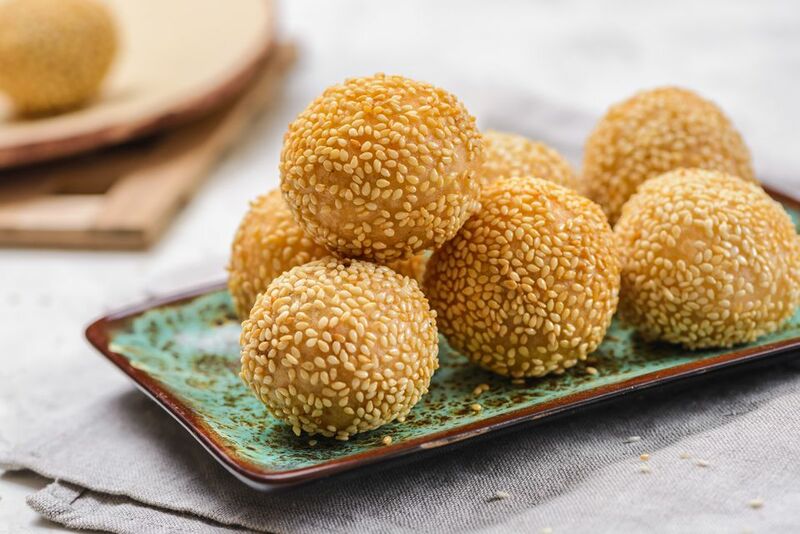 Sesame seed balls are one of the most popular desserts in China and Taiwan. Street vendors sell them and you can also get them at dim sum restaurants. Authentic sesame seed balls usually use a sweet red bean filling but you can swap this with sesame filling or even a peanut filling if you like. The key cooking tip for this dessert is to never use a high temperature to fry the sesame seed balls. The ideal temperature for frying is 250 F (120 C). High temperatures cause the sesame seed balls to pop open and leak the filling. This is one of the more difficult Chinese recipes. The problem comes during deep-frying—the sesame seed balls need to be turned continually to expand. It takes practice to skillfully maneuver the balls in the hot oil. Even with practice, you may not have the perfectly shaped, large sesame seed balls sold at Chinese bakeries. Please be very careful when you deep-fry the sesame seeds balls. This dessert is better served while it’s still hot and it’s not suitable for storing in the fridge. Ideally, eat it as soon as possible for the best taste. In a wok or deep-sided, heavy saucepan, preheat the oil for deep-frying to 250 F. Make sure that there are at least 3 inches of oil in the wok. Spread the sesame seeds over a piece of wax or parchment paper. Place a small bowl of water beside the sesame seeds. Dissolve the brown sugar in 1 cup of the boiling water. Place the rice flour in a large bowl. Make a well in the middle of the bowl and add the dissolved sugar and water mixture. Stir until you have a sticky, caramel-colored dough, adding as much of the remaining 1/3 cup of boiling water as needed (don't add the water if not needed). Pinch off a piece of dough roughly the size of a golf ball. Use your thumb to make a deep indentation in the dough and then the thumb and index fingers of both hands to form the dough into a cup. Roll 1 level teaspoon of sweet red bean paste into a ball. Place the red bean paste in the hole, and shape the dough over the top to seal. It is important to make sure the red bean paste is completely covered. Continue with the remainder of the dough. Dip a ball into the small bowl of water (this will help the sesame seeds stick to the ball). Roll the ball over the sesame seeds. Repeat the process with the remainder of the balls. Deep-fry the sesame seed balls, a few at a time, in the hot oil. Once the sesame seeds turn light brown (about 2 minutes), use the back of a spatula or a large ladle to gently press the balls against the side of the wok or saucepan. Continue applying pressure as the balls turn golden brown and expand to approximately 3 times their normal size. Drain the deep-fried sesame seed balls on paper towels. If preparing ahead, refrigerate and then reheat the balls until they puff up again.